Before starting Townfolio, founders Davie Lee and Ryley Iverson discovered that companies looking to realize business opportunities in smaller communities were facing a significant problem: TMI (too much information). Lee experienced this problem personally, as he had previously been working with an Irish government agency that helped companies expand into Canada. Lee’s job was primarily finding information and data on municipalities and he realized it was a difficult and time-consuming process to find substantial information. After moving from Toronto to Saskatchewan, Lee reconnected with Iverson (the two had known each other through work) and Lee pitched an idea to help fix the problem of inaccessible community profiles. For Iverson, it wasn’t a tough sell. He has a background in the economic development space and also grew up in Saskatchewan, witnessing firsthand how there was a saturation of certain businesses in Regina and Saskatoon while smaller areas struggled to attract business. 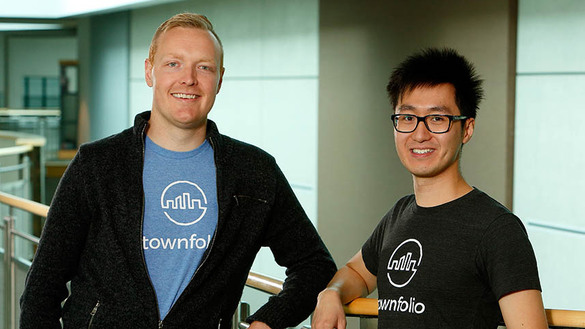 In November of 2015, Lee and Iverson launched Saskatoon-based Townfolio, which they market as an online community profile network used by municipalities and businesses to access hard-to-find public data and discover local opportunities across Canada. Instead of browsing through lengthy printout copies of community profiles, Iverson explained that companies can log on to https://townfolio.co, which stores numerous community digital profiles. When a municipality decides to utilize Townfolio’s services, Townfolio aggregates their public data from over 30 data sources, visualizes the community’s data into interactive charts and automates the community profile for you. When someone visits the site, they can search or browse through random communities, narrow it down by communities who currently have business opportunities, and also search for industries that communities want to attract. For example, if you were to search for Shellbrook, you’d be brought to a digital community profile that shows a picture of Shellbrook and a snapshot of its prominent industries (agriculture, services, construction, manufacturing and tourism). There’s also a short written and video bio posted on the site. On the side navigation pane, there’s contact information for the town’s chief administrative oﬃcer and links to important information about the area such as demographics, labour force and taxation. Many of these areas consist of charts and graphs that Townfolio has visualized. If you’re instead searching based on business opportunities, you would find that Unity is looking for a bowling alley, Weyburn is in need of a grocery store and Langham desires a restaurant. Townfolio is also working on a compare feature that allows users to do a realtime comparison of how multiple locations stack up when it comes to demographics, labour force, quality of life, etc. Having done a considerable amount of research before launching the product, Townfolio was confident in its features. Prior to the company’s formation, the founders spent six to eight months interviewing municipal governments and economic developers to gather information that would help Townfolio build a software relevant to their needs. “Customers were saying to us that if we built a solution that required them to enter the data themselves, they would not join. They said they didn’t have the time, budget and technical skills to manage their data, make it visually appealing, and promote the community for investment,” said Iverson. As with any new business venture, Townfolio has experienced some setbacks. Iverson noted that selling to the government with no track record is extremely difficult, so the vast majority of the company’s sales have been organic. The company frequently attends trade conferences, setting up displays and making presentations. Townfolio has received recognition for its work. The Spin Master Innovation fund named the company one of the most innovative start-ups in Canada in late 2016. Three clients using Townfolio’s software have received a national marketing award in the last two years from the Economic Developers Association of Canada, including the Saskatoon Regional Economic Development Authority. Townfolio currently has six employees but is closing a round of financing that will enable it to double its workforce. The company has expanded into the U.S. and is in discussions with Europe, and will be going to a conference in Africa to present to representatives of a handful of countries.